Have you ever visited imdb.com? The site is full of movies and almost every imaginable piece of information about them: the actors, the directors, the crew, the release date, the runtime, the ratings, the reviews, and more! Have you ever wondered how all that data about the movies is stored? Turns out that it’s stored in databases! Databases allow us to store and manipulate data, and SQL is the language of databases. SQL stands for Structured Query Language. Basically, creating databases through SQL allows us to create meaningful data structures: we can group data together that are part of a larger whole, and we can form relationships between data in different groups. Want to know how to create a database in SQL? Read on, my friend! Let’s run with the movie example from earlier. From the command line, the below code will create the database “movie_library”. The title is defined as “TEXT NOT NULL”. The “TEXT” word tells what kind of data the title is. It’s just text. “NOT NULL” tells SQL that there must be a title entry in the row. Normally it’s okay to leave a blank cell in a row — it’ll just be filled in as null. But in this case, the title cannot be null. You’ll notice that the year_released is an “INT”. That just means that it’s an integer — a whole number. The INSERT INTO keywords tell SQL that we’re going to put a row into our table. Then we give SQL the name of our table, “movies”. Then we tell SQL which columns we’d like to fill out (title, primarydirector, yearreleased, genre). Finally, we provide the values for those columns: VALUES ('The Lord of the Rings: The Two Towers', 'Peter Jackson', 2002, 'fantasy');. What if we wanted to give each of our movies a rating? Well, ratings are kind of general information; they don’t belong to any specific movie, but are related to many movies. Why don’t we create a separate table for the ratings, and then connect that table to our movies table? That’s basically a “One to Many” relationship. A movie can only have one rating, but a ratings can be held by many movies. Now we need to connect the movies table to the ratings table. For this, we need what is called a “Foreign Key.” The Foreign Key is what relates one table to another. In this case, our foreign key will be the column “ratingid” in our movies table. Why call it “ratingid”? Well, we want to indicate that we’re connecting to the ratings table! And we want to match movies to ratings based on the rating’s id. So if a movie has a rating_id of 2, it’d have a rating of PG. You’ll notice the “NULL” above. That just means that we don’t absolutely need a ratingid. Maybe the movie isn’t rated yet. That’s okay. That field can just be null. “REFERENCES” is what connects the ratingid column to the ratings table. 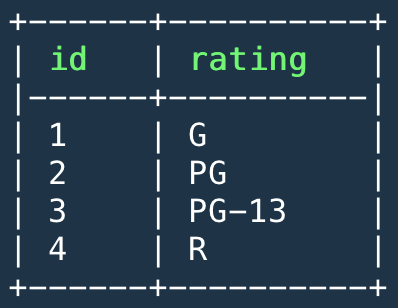 And finally, “ratings (id)” tells SQL that we want our rating_id column to match the id column of the ratings table. Let’s add some ratings! For the sake of ease, movies 1–3 will be rated G. Movies 4–6 will be rated PG. Movies 7–9 will be rated PG-13. That’s that! We successfully created a movie library database. Then we created a table for the movies and a table for the ratings. Finally, we connected the movies to their corresponding ratings by joining the two tables.